The studio-apartments Kapetanios (B class) is situated in Perissa, the most beautiful and largest black beach of Santorini. 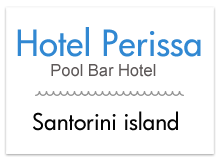 Guests of apartments Kapetanios are free to use the pool of Hotel Perissa, situated just a hundred meters from the apartment complex. More information can be provided at the pool bar. The complex consists of five studios and two apartments. Each of the 7 studios or aparments has a bath, air-conditioning, fridge, TV, kitchen, safe box, and private balcony. All rooms also have access to free wifi. Apartments Kapetanios is situated on the beach of Perissa, one of the most famous beaches of Santorini thanks to its unique black volcanic sand. Perissa is a very well-organized beach with a lively village only a short walk away. There are bus connections from Perissa to everywhere on Santorini.